Astor Piazzolla (1921-1992) wrote this piece for the Fifth International Guitar Festival of Liège, which held in 1985. 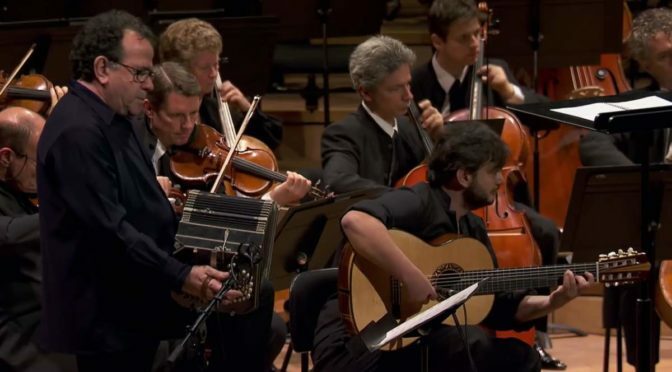 At the premiere, Piazzolla played the bandoneón himself, and the guitar part was played by the Argentine guitarist Cacho Tirao (1941–2007). The soloists were accompanied by the Liège Philharmonic conducted by Leo Brouwer (born March 1, 1939 in Havana, the Cuban composer, conductor, and guitarist). 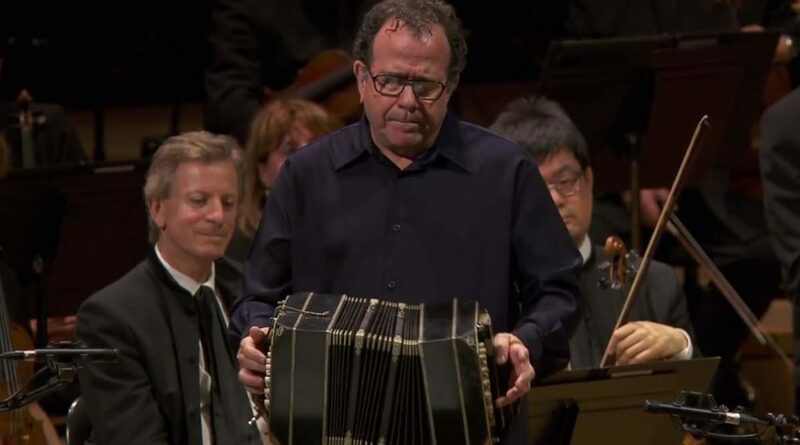 Richard Galliano (born December 12, 1950, Cannes, Alpes-Maritimes) is a French accordionist. He was drawn to music at an early age, starting with the accordion at 4, influenced by his father Luciano, an accordionist originally from Italy, living in Nice. After a long and intense period of study (he took up lessons on the trombone, harmony, and counterpoint at the Academy of Music in Nice), at 14, in a search to expand his ideas on the accordion, he began listening to jazz and heard records by the trumpet player Clifford Brown. “I copied all the choruses of Clifford Brown, impressed by his tone and his drive, his way of phrasing over the thunderous playing of Max Roach”. Fascinated by this new world, Richard was amazed that the accordion had never been part of this musical adventure.In this period, Galliano won twice the first prize in the “world accordion cap competition” which took place in Spain (1966) and France (1967). In the Spanish competition, the participants’ duty work was “Chaconne” by the Israeli accordionist Yehuda Oppenheimer. Galliano and Oppenheimer kept up their musical collaboration and personal friendship until Oppenheimer’s death in 2012. Yamandu Costa (born January 24, 1980 in Passo Fundo), sometimes misspelled Yamandú, is a Brazilian guitarist and composer. His main instrument is the violão de 7 cordas, the Brazilian seven-stringed nylon guitar. Yamandu began to study guitar at age seven with his father, Algacir Costa, leader of the group Os Fronteiriços (The Frontiersmen) and mastered the instrument after studying with Lúcio Yanel, an Argentine virtuoso who lived in Brazil. At age fifteen, Yamandu began study Brazilian Southern folk music, Argentina and Uruguay. Influenced by the music of Radamés Gnattali, he began to study the music of other Brazilians, such as Baden Powell de Aquino, Tom Jobim and Raphael Rabello. At age seventeen he played in São Paulo for the first time at the Cultural Circuit Bank of Brazil which was produced by the Study Tone Brazil. Yamandu came to be recognized as the musician who revived Brazilian guitar music. Yamandu’s diverse execution styles include styles like chorinho, bossa nova, milonga, tango, samba and chamamé, making him difficult to categorize into a single genre. Yamandu appeared in Mika Kaurismäki’s 2005 documentary film Brasileirinho. Alondra de la Parra (born October 31, 1980, New York City) is a Mexican conductor. She is the daughter of Manelick de la Parra, a writer and editor, and Graciela Borja, a sociologist and educator. Her father was a film student at New York University and her mother a sociology student at the New School at the time of her birth and early childhood, through age 3. The family subsequently moved to Mexico City, where de la Parra began her piano studies at age 7 and the cello at age 13. She also developed an interest in conducting around age 13. After a year of study at St Leonards-Mayfield School, she studied composition at the Centre of Research and Musical Studies in Mexico City. At age 19, de la Parra returned to New York City, to study piano and conducting at Manhattan School of Music. She obtained a BM in Piano Performance under the direction of Jeffrey Cohen and studied conducting with Michael Charry and Kenneth Kiesler, receiving an MA in Conducting in 2008. Her other conducting mentors include Marin Alsop, Charles Dutoit, and Kurt Masur. She served as an apprentice conductor with the New Amsterdam Symphony Orchestra. In 2003, de la Parra founded her own ensemble, the Mexican-American Orchestra, at the behest of the Mexican Consulate, which asked de la Parra to produce a concert featuring Mexican music for the Mexico Now Festival. The resulting 65-member orchestra subsequently was renamed the Philharmonic Orchestra of the Americas (POA), as of 2004. The POA toured to Mexico in 2007. The POA and de la Parra released two commercial recordings, Mi Alma Mexicana – My Mexican Soul, and Travieso Carmesí. In June 2011, the POA suspended operations because of financial difficulties. de la Parra was artistic director of the Orquesta Filarmónica de Jalisco from 2012 to 2013. In May 2015, de la Parra made her first guest-conducting appearance with the Queensland Symphony Orchestra (QSO). In October 2015, the QSO announced the appointment of de la Parra as its first-ever music director and first-ever female conductor in its principal conducting post, effective in 2017. Alondra de la Parra and her family reside in Mexico City. She is currently a UNICEF Ambassador and an official Cultural Ambassador of Mexico.